Shopee, the leading e-commerce platform in Southeast Asia and Taiwan, exclusively introduced Huawei’s latest smartphone, the Honor 10 Lite, to their over 21 million users in the Philippines last Jan. 25. According to Martin Yu, Associate Director of Shopee Philippines, Honor was included on the list of best-selling brands on their app throughout the year of 2018. ‘’As the demand for premium tech products continues to grow in the Philippines, Shopee will bring even more unbeatable deals on leading brands to our Filipino users in 2019,’’ Yu added. Wang Yang, Country Director of Honor Philippines was proud to launch their new Honor 10 Lite and took note of their successful partnership with Shopee again. ‘’Honor has grown our online presence rapidly since joining Shopee in 2018, with our orders increasing by over 350%. We believe this partnership can reach even greater heights in 2019,’’ he said. 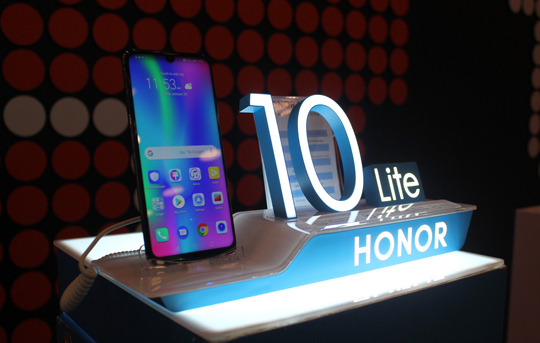 Honor 10 Lite features a 6.21-inch LCD screen, a 1080 by 2340 pixels full view display, and 24 megapixel front camera and 13 megapixel on its rear with an additional two megapixel for its phase detection auto focus. It has an octa-core CPU equipped with Hisilicon Kirin 710 chipset that is powered by Android 9.0 (Pie) as its operating system together with a 3GB of RAM and hybrid dual sim (nano-sim, dual stand-by). Honor 10 Lite can cater up to 512 GB of external storage and has a built-in 3400 mAh battery capacity. Its price varies depending on the internal storage of the device —P9,990 for the 32 GB and P10,990 for the 64 GB. Honor 10 Lite exhibits three stylish and eye-catching gradient colors such as sapphire blue, midnight black and sky blue. Those who bought the Honor 10 Lite at its first day on Shopee enjoyed the 15% discount, getting it at P8,491 from the original price of P9,999, to go with P3,000 worth of freebies—Honor Band 4 Running, Honor Gift Box, and a Honor foldable luggage. Honor 10 Lite will be available on Shopee until Feb. 8.